The following step-by-step example illustrates using the authorization code grant type. 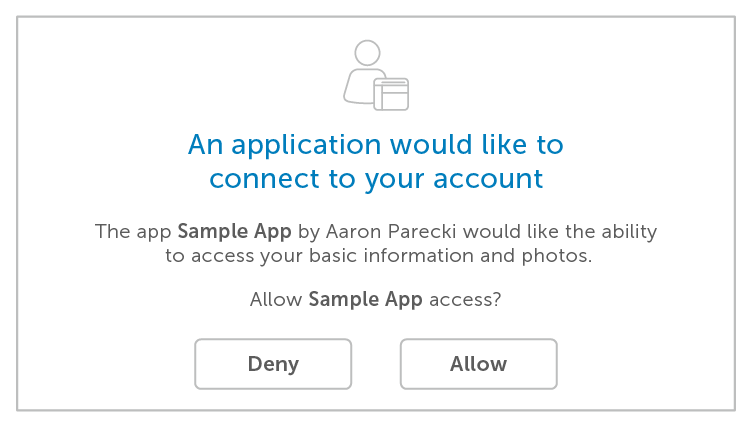 The app initiates the flow by crafting a URL containing ID, scope, and state. The app can put this into an <a href=""> tag. Upon being directed to the auth server, the user sees the authorization request shown in the illustration below. If the user approves the request, they will be redirected back to the app along with the auth code and state parameters. The service sends a redirect header redirecting the user’s browser back to the app that made the request. The redirect will include a “code” in the URL and the original “state”. The app uses the auth code to get an access token by making a POST request to the authorization server. The auth server validates the request and responds with an access token and optional refresh token if the access token will expire.